The West Coast’s dispersed geography presents a larger challenge to low-waste living than many other parts of the country. Outside of Westport and Greymouth, access to bulk bin stores is minimal and smaller communities some distance from these towns could really benefit from co-ops to help reduce waste and the costs of bulk buying. In the interim, the wonderful Kominaya Organics does deliver unpackaged wholefoods throughout the West Coast, and delivery is reduced (or even free) for purchases above certain amounts. At present, these orders will be delivered in brown paper bags which, while plastic-free, is not zero waste. However, there may be scope to develop reuse systems with returnable glass jars. These are questions that we’ll leave up to locals to work out. 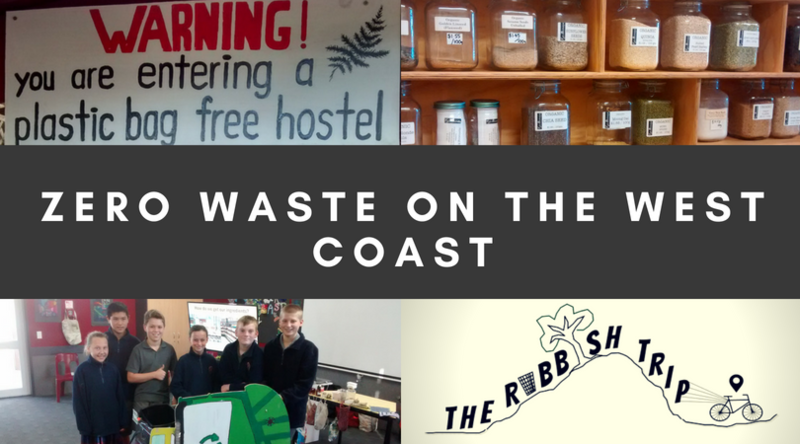 Needless to say, there are many other initiatives occurring across the West Coast that involve communities coming together to reduce waste and lots of opportunities, beyond simply where you shop, to make a dent in your household rubbish. The shopping sections of this guide are divided into two geographical sections for ease of reference – follow the links below to view. On this page, we have listed community groups and services throughout the region, so make sure you scroll down and view this list too, alongside the shopping guides! Food waste – food waste and scraps going to landfill not only produces methane, but also represents the loss of an excellent resource that could be turned into compost to enrich our soil, or, if the discarded food was still edible, the loss of perfectly good food that could go to someone that wants to eat it! If you would like to set up your own home compost, worm farm or bokashi system so you can deal with your organic waste at home, the Grey District Council has some good info and resources on their website to help you set a system up. If you are a Westport business chucking out food that is still edible but not saleable, you can get in touch with The Sharing Shed – a great initiative that takes from businesses edible food that would otherwise go to waste, and redistributes it for free. E-waste – electronic waste is the world’s fastest growing waste stream, with huge environmental implications because of the toxins that can be leached from this waste, but also the loss of incredibly precious resources embedded in these items that are not recovered when the waste is dumped in landfill. Rather than throwing you broken electronics out – have you considered trying to get them repaired first? You could pay someone to do it, or look out for Repair or Fix-it Cafes where experts donate their time to fix people’s broken items for free at a designated repair event (usually run by community centres, churches or councils). If your electronics really have given up the ghost, rather than chucking them out, see if you can take them to your local transfer station to be recycled (for example, you can do this at McLean’s Pit in Greymouth) – it will come at a cost to you (until the Government starts to regulate manufacturers of these products), but it’s a small cost relative to damage these items otherwise cause in landfill. Alternatively, you can drop off small electronic items for free at Go Tech, 65 Mackay Street, Greymouth (they state that they can take “any dead or unwanted phones, tablets, laptops and desktops” as well as “old cables and really anything reasonably small which might have a circuit board in it like modem routers and other network hardware”). An alternative for glass jars? In Buller District, Kominaya Organics is happy to take your empty glass jars for sterilisation and reuse in the shop. This is especially good if you’re up in Karamea where glass has nowhere to go but the landfill. Perhaps stock some up and take them with you to Kominaya next time you’re in Westport. Toy Libraries – reduce the wasteful over-consumption of toys and save money by joining a toy library! Check out this guide to find the nearest Toy Library to you. West Coast Timebank – There’s a timebank on the West Coast and this is awesome because timebanking and zero waste living are great companions. Through timebanking you can share skills and services without the exchange of money, making it a great way to reduce waste on a budget because you can harness skills of creating and repairing that exist in your community (repairing broken clothes or electronics, for example), or have someone pass these skills on to you (how to garden, how to build). Perhaps you have some of these skills already that you could pass on to someone else for time credits? If this sounds like the kind of thing you might be into, check out the local timebank – they’ll be thrilled to have you! We also heard through the grapevine that through the West Coast timebank you can also share tools, meaning that there’s no need for every person and his or her dog to own a set of tools, instead they can be shared to reduce the over-duplication of resources. Menzshed provides a great opportunity for men of all ages to share tools and a workspace (reducing the wasteful overduplication of these resources) and to pass on skills of woodworking and other trades. Menzsheds frequently offer communities the service of repairing broken items like furniture (at a small cost), and also creating bespoke items for community and charitable purposes. There are Menzshed groups throughout the West Coast, so definitely look up your local! Community gardens are an excellent way for residents to get kai without packaging, and to learn skills of growing food and setting up composts – both very useful skills for low-waste living. There are community gardens dotted around the region, including Community Māra Kai in Hokitika and the community garden at Number 37 Community House, 37 Peel Street, Westport – both are definitely worth checking out! Community gardens are always looking for volunteers to help out and come along to working bees, so if you are interested in picking up gardening skills, or if you are already a keen gardener and would like to have the opportunity to share your skill with others, consider getting involved with your local community garden. Incredible Edible West Coast – Food growing from the ground is unpackaged and naturally zero waste – so we’re always on the prowl for living fruit, herbs and veg to pick. So we were very excited to discover that the West Coast has its own branch of Incredible Edibles, which makes it possible to find food growing around the streets of town and for all of us to get amongst it! Check Incredible Edible’s Facebook for an explanation of this amazing public food growing project, as well as how you can become involved. Kane AKA The Urban Gardener – If you’re into learning a thing or two about gardening to take to your own home, check out the classes run by Kane, which are currently running out of Number 37 Community House, 37 Peel Street, Westport. Sewing, crafts, knitting, crochet – We’re of the view that sewing, crafts, knitting and crochet are all key skills for combating waste in our lives (whether it’s the ability to make your own produce bags and beeswax wraps, knit a dishcloth, or repair broken clothes). Throughout the West Coast you can find lots of great organisations and small businesses where you can either learn or pass on those skills, complete community sewing projects, attend workshops, or simply complete your own sewing projects in the company of others. Craft/knitting/crochet/flax weaving – If you’re into joining a knitting, crocheting and/or general craft group, there are awesome groups in Greymouth, including the CoRE/New Coasters supported Greymouth knitting group and In Stitches, up North in Karamea there’s also the Craft Ladies, who meet weekly and there’s also a flax weaving group in Karamea too – great to learn how to use the natural fibres all around us. Learn how to sew, repair clothes, and/or upcycle fabrics – check out workshops by Sew Hokitika, 139 Hampden Street, Hokitika, Number 37 Community House, 37 Peel Street, Westport or Pink Possum Quilting, 511/A State Highway 6, Greymouth. Number 37 Community House also has sewing machines and overlockers that you can use for your own projects free of charge, and a fabric bank with lots of upcycled fabrics available for your sewing projects! Getting clothes repaired – If you’ve got broken clothes and you’re really not sure how to repair them yourself or don’t really want to, you could consider paying someone else to do it rather than chucking the clothes out. For example, Sew Hokitika, 139 Hampden Street, Hokitikia or Stitched Up Real Good, Westport. Groups sewing reusable bags to give out to the community – a great way to learn to sew while helping to reduce plastic bag consumption. These groups are always looking for volunteers (regardless of whether or not you have prior sewing knowledge) for sewing bees. Check out your local Boomerang Bags group – there are branches throughout the West Coast, from Fox Glacier upwards, so get amongst it! Community centres and community organisations making things happen – there are a whole host of skills, ideas and initiatives that can help with low-waste living, from how to garden and compost, to preserving and fermenting foods, upcycling, knitting and crocheting, how to repair items, basic woodwork, and so on. There are several centres and public learning spaces that run workshops like this on a regular basis, on a wide range of topics, throughout the West Coast, so it’s well worth checking them out and their workshop schedules. These centres include Fox Glacier Community Centre, 45 Cook Flat Road, Fox Glacier; The Green Team Hokitika; West REAP, 72 Tudor Street, Hokitika; CoRE/New Coasters, 38 Albert Street, Greymouth; Buller REAP, 111 Palmerston Street, Westport; Number 37 Community House, 37 Peel Street, Westport; and Karamea Community Arts Council (contact their FB page to find out about workshops coming up around Karamea).